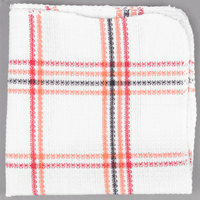 This Chef Revival 706DC 13" x 14" striped waffle-weave dish cloth is woven from 100% cotton, making it super-absorbent. Multicolor stripes provide fast identification to avoid cross-contamination, and its smaller size makes it easy to carry while working. The waffle weave design allows for superior scrubbing ability, making clean-up after service a breeze. These are decent towels and I always have them handy. The Waffle Weave pattern has advantages, and the price is great. I would caution that the color in these does run when washed in hot water. THESE ARE VERY NICE SMALLER DISH CLOTHES. WE ALWAYS USE BLEACH, AND THE COLOR STAYS AND THEY LAST A LONG TIME AND THE PRICE IS GREAT. I bought it for my ice cream shop, and it works great to remove dirt and grease. I would buy it again. highly recommend it. These are perfect cheap dishcloths that I don't feel bad throwing away if they get ruined because they are so cheap. It works great as something that is in between a paper towel and a nice dish cloth. I can resuse it as much as I want like a normal dishcloth, but when it gets used for something that is really really gross I can just toss it and not worry about it. These are your standard cotton kitchen dish cloths that wipe up spills nicely. They are quite absorbent; water rings out of them quite well. They make clean up easy! Great cotton dish cloths. Cleans up messes easily and quickly everytime. Most liquid spills can be cleaned with one wipe. Small and large size fold perfectly to fit in drawers for tidy storage. Great product. I use these for dishes (especially items that would shred a sponge) and for wiping counters. easy to wash, they hold up well, and a good value..
As a residential user, I am not extremely familiar with sizing. 13" x 14" sounded like a decent size, but when you actually hold them, they are a bit small for use as a household kitchen towel. They also don't seem to absorb much at first, although once wet they do an ok job. When I need to reorder, I ill probably go for a larger size and maybe a different material. I use these all throughout my home instead of paper towels. They are great for the normal kitchen use: counter wipe down and washing dishes, but after their first wash they shrunk quite a bit (i expected this as they are cotton) and I found they were the perfect size for all kinds of jobs, from cleaning furniture, and cleaning up after my cats! I plan to order more! Hardworking, absorbent dish cloth. These look super cute in our kitchen and are nice to have handy to wipe things up. The colours are assorted (the ones we received have yellow, green, and blue stripes, not the colours pictured). this dish cloth absorbs a lot of water without leaving streaks.the design is also very nice and classy.the fabric is also very good quality.highly recommended. This towel is very thin, and does not absorb water very well. For the price they aren't terrible, but I would honestly recommend spending a few extra dollars for the thicker cloths. Also the color is not always the color shown, I have gotten different colors the few times I ordered the product, not a big deal to me, but if you have a color system for towels at your store it might be. We were not thrilled with these towels. They worked fine in the beginning, but after being washed a few times they got very stiff and stopped absorbing water. We appreciate your review, Sally! If you ever have any questions about the product you are purchasing, please contact our Customer Solutions team. Very nice dish cloths. Thin, but sturdy...just what you need for glasses (or should I say, for not breaking glasses). They hold up well compared to others when kept in our water/sanitizing solution in between uses. These dish cloths are definitely great quality. I have washed them several times since purchasing them and they are holding up great. The price is great too. Solid little dish clothes here. Very nice design looks good year round. Towels could be a bit more absorbent but they still get the job done! Great wash cloths for our business and home use as well. They are not super absorbent, but good for cleaning purposes. I am definitely going to order these again. So far so good although I've had to throw a few out but not unhappy really they just get worn out between all the chemicals, use and being washed a lot. I'd buy them again when I need more. Love these! The texture is great for deep cleaning or just for cleaning a knife between uses. I am getting ready to order more as they take a bleach washing so well and I have had no complaints from my 68 year old stubborn employee. Unlike other towels, these have not discolored from, BBQ sauce, hot sauce, tomatoe sauce and roasted red peppers and mustard. And they have kept the same sauce. I'm ordering more only because I hope to do,less laundry! Much needed new wash cloths. These are large and well made. Decent price for twelve of these towels. Stocked up for effective dish washing needs. These dish clothes shrunk by about 1/3 after first wash. Durable. Use frequently and no holes. Texture is nice and ribbed and useful for scrubbing. Great value. These are good. My husband got them for our home and they are very much restaurant quality. Do not really have a home type feel. Good cheap dish cloth. They last too! We wash them all the time and they keep coming out fine. I love it when its cheap and good. These are nice little cloths to have around the house and business. I find that they are absorbent and work great! The only downside I have found is the color strip fades a little fast, but hey, no big deal for the price! I run a restaurant, and the dish rags in the kitchen started to get a little worn out. I ordered these Chef Revival Cotton Dish Cloths to replace them, and have been very happy with them. The weaving seems strong, and have lasted a month without wearing in places. The pattern is nice, and is better than all white ones I had previously. I would recommend them to anyone needing some general purpose dish cloths! I could find a million uses for these waffle weave dish cloths, wipe counters, dry silverware, has enough "scrubbing" power to in depth cleaning as well. These are nice little cloths to have around the house. I find that they are absorbent and work great! The only downside I have found is the color strip fades a little fast, but hey, no big deal for the price! Great but for this Chef Revival 706DC 13" x 15" Striped Waffle-Weave 100% Cotton Dish Cloth - 12 / Pack good quality of dish cloth that u can use at anytime and washed again awesome!!! These cloths rock. They are nice and absorbent and made of a durable, rather rough material. They scrub things nicely and clean up and dry fast. I am very pleased with these towels. These towels held up very well. In my home kitchen. Their texture works great for cleaning. Amazing price as usual. These towels are great! Bought them about 5 months ago and still using them. Since it comes in a pack of 12 I just use one almost every day then at the end of the day throw it in a laundry basket and cycle use. No signs of wear yet. I would recommend washing these before using since they don't want to dry dishes very well with the first use. After an initial wash, these hold up great and dry very well. I am a home cook and own a lot of stainless steel cookware and have a glass top stove. I use a lot of cleanser like Bartenders Friend and therefore go through a lot of dishcloths. I ordered these and they fit the bill. They are cheap enough to use everyday yet hold up quide well under all the scrubbing I put them through. A great affable kitchen towel, we use these for our coffee service area. You need cheap reliable towels for an espresso machine and these work great. I tried other dish cloths but none adds up to these. They work great in our kitchen as we cook a lot , They stand up 100% after washing. Storing is much better. Great Deal. These dish cloths are great. They are thicker that I expected for the size and the waffle weave helps to get stuck on stains off pots and pans. I would to see some sized about 10 by 10 inches. Thanks! I was raised using sponges for dish washing. The price of those comes to a pretty penny. I finally woke up and ordered these. They are excellent for hand-washing and then go into the washer. I don't buy sponges anymore. This is a very good price for a strong wash cloth - these packs will hold up, they do shrink a bit after washing so you might end up with a one foot square. very nice looking dish cloths at an affordable price! should have ordered more than 1 package. you might want thicker ones for a commercial kitchen, but for home use they are perfect. Great dish cloth...I love getting these in quantities of 12, they hold up well and the price is hard to beat, love the selection at the webstaurant. These dish clothes work great! They are sturdy for the great price and they look good. We will definitely be reordering these when we need them! I ordered the twelve pack for my apartment and couldn't have been happier. They work exactly as intended and very well at that. Be careful if you wash / dry them, they will shrink to half the size! These were great. They work like a charm, they're quite absorbent and they're quite large. I threw one in my dryer by accident and it only shrunk a little bit. Getting 12 of them for this price is quite the deal. This is a heavy duty dish cloth that is great to use in the restaurant and at home.. Holds up well to tough cleaning, daily use, and frequent washing. Will purchase these again. I purchased these in 2012 and still have several of them hanging around. Now you need to understand, if it is used in my kitchen, it gets washed with bleach. This does take a tole on textiles, these have not all survived however I have given them the "business." Great product to endure this long in my home! This Waffle Weave dish cloth is great for our restaurant. We use it for dishes, wiping down prep areas. They are a good size, a little big for dish washing but I make them work. They were okay. I washed and dried before using and they shrank considerably. They still serve their purpose and dry dishes just fine but I wish they looked a bit better. We purchased these towel for washing our dishes. So far so good. Have held up through countless washes both in the sink and the washing machine. Great item. Will be purchasing more in the future. I bought these for my classroom based cafe. They are a little flimsy but have worked out well for our soups and desserts. I think they are a good buy for the money. The Chef Revival 13" x 15" Waffle - Weave Dish Clothes sold 12 per pack. They are great hold's up from the washer, dryer, to cleaning again. The colors are the same in each pack. The price is great, When I need more I will reorder. Rags are great - hold up with multiple washes, look attractive, and soak up liquid really well. We use some for washing and others for drying. These are too pretty to use. The coarse thread pattern is great for gripping while wiping up dishes. Quality is great and price is reasonable. This is a very good waffle dish cloth for washing dishes, wiping tables, and a lot of other stuff that you do in the kitchen. These Chef Revival Dish cloths look big and thin when you get them but when you wash them they fluff right up. Very satisfied with mine. I love these dish towels. We use them everyday to wipe down clean pots and pans and then wash them at night. They don't wear down. Great towels. These chef revival waffle weave dish cloth are great they are great for whipping off your counter top, dishes, or you tables and they are well made. Great buy! These chef Revival waffle weave dish cloths are very good for wiping down counters, Tables and the dishes you have to wash by hand. Well Made. The Chef Revival dish cloths are nice size and work well for everything from wiping down tables to scrubing pots. Really well made. very satisfied. This was a great deal to purchase. it's thicker than i thought, it will last a long time. The Che Revival 13" x 15" Waffle Weave Dish Clothes sold 12 per pack. They were more than I expected. The size and thickness are great. I purchased two 12 packs of these chef rival dish cloths to try. They are Great for wiping down counters and even drying pots and pans.They are well made and great price. I will be ordering more. Thank You webstaurant! These little towels definitely serve the purpose. They are priced reasonably. They are light weight and I like the fact that they dry quickly. Great to use in my mobile commercial kitchen. Will definitely order more. these towels are great! awesome for the front of the house. its nicer for guests to see a nice patterned towel instead of just plain white rags. This dish cloths are just the right size and are good for home use as well. You can't beat the price. This site has the best prices. These are about twice as big as your standard washcloth you would see at a consumer retailer. I thought this would be annoying at first but it ended up coming in handy as long as you can work the cloth. It is fairly course which helps to get stuck on food. I would definitely recommend for home or business use. This is an absolutely top grade dish towel. It absorbs really well, and cleans up perfectly. They have a very long life, and clean up well. great product. I love the quality of these dish towels. I always keep some on hand and they don't fall apart after washing them. I am satisfied. Every kitchen should have these waffle-weave dish cloth. They are indispensable and very useful to have around the kitchen whether for wiping dishes or drying hands. 12-pack is really useful because you can replace the towels before the washing. These are the best dish cloths I've ever used! The waffle weave gives them the perfect texture for scrubbing. I almost never reach for a scrub pad. And really fast shipping, too. These were lighter than I thought they'd be, but they fluff up quite a bit with washing and stand up to use very well. They're rugged, they're 100% cotton, and you can't beat the price.